Do you not know that your bodies are members of Christ? Or do you not know that the one who joins himself to a prostitute is one body with her? For He says, “The two shall become one flesh.” But the one who joins himself to the Lord is one spirit with Him. (1 Corinthians 6:15-17). When we speak of intimacy, let us be clear on the kind of intimacy we are talking about. This verse is contrasting what it is to be joined sexually with somebody to become one flesh, and what it is to be joined with the Lord and become one spirit (which is the goal for us in pursuing intimacy). True intimacy is giving yourself to another. He has done that for us, and it is what He is seeking from us. ‘Get ready for a breakthrough unlike any other you’ve had in the past. You may have had breakthrough in your finances, or in other areas of your life, but this is a breakthrough into intimacy. That’s right, the King Himself has invited you into His chambers to tell you the secrets of His heart. The Lord is about to woo you into deeper levels of love, revelation, and passion. You’re breaking through a barrier of flesh, and entering a new season of relationship with the Lover of your soul. You may have distanced yourself from Him because of fear, or doubt of where you stand in your relationship with Him. Today the Lord says, “Let My perfect love cast away all your fears.” Drop any preconceived notions you may have in your arms now and prepare for a full embrace with the King’. Jesus said, ‘ I am in the Father, and you are in Me, and I am in you’ (John 14:20). You really can’t get much more intimate than that. When we give our lives to Him, when we enter into a personal relationship with Him, the Father and the Son and the Holy Spirit come to live on the inside of us. There is a song by U2 that I really used to love: “Still haven’t found what I’m looking for”. I would sing that and really mean it from my heart, because I knew in my spirit that there was more, and I had not found it. I can’t sing it and mean it like that anymore, because actually I have begun to find and walk in my destiny. My destiny was out in the realms of the heavens. It is not ‘written in the stars’, but it is to be in the stars. First of all, there is the record of your eternal destiny. Then there is the Book of Life. Then I saw a great white throne and Him who sat upon it… and another book was opened, which is the book of life; and the dead were judged from the things which were written in the books, according to their deeds… And if anyone’s name was not found written in the book of life, he was thrown into the lake of fire (Rev 20:11-15). All our false names/natures are NOT written in the book of life, while all our authentic God-crafted names/natures ARE written in the book of life… What gets excluded from the book of life gets cast into the lake of fire. These elements are not our whole beings, but rather are toxic aspects of our non-being – false identities, sin masks which have deformed, debilitated, and impoverished us from manifesting our original created purpose. These forged identity masks have grafted themselves, with our consent, onto our souls and must be carefully irradiated and excised by the curative and corrective knife of divine love. …to say that the personification of all the dark dynamics within us will be destroyed (i.e. NOT written in the book of life) is ultimately a wonderful thing, all our false sin-identities cast into the lake of fire nevermore to trouble us again1. But there is also a scroll of your life, the record of the life you have lived. We know that Jesus took away the power of sin and death and there is no further judgment for sin, but we will be judged according to whether we have come into our destiny or not, whether we fulfilled God’s purpose for our lives. What is written on the scroll of your life? Does it match up exactly with what is written on your scroll of destiny? My personal experience is that it does not. But we can change that too. We can come into agreement with our destiny, and God can change what is written on the scroll of our life. For we must all appear before the judgment seat of Christ, so that each one may be recompensed for his deeds in the body, according to what he has done, whether good or bad (2 Cor 5:10). Where it mentions ‘good or bad’. it is not speaking about sin, but about the motives of our hearts. You do not have to wait until you die, or until Jesus comes, to go to the judgment seat of Christ. I have been there, the scariest place I have ever been in the heavenly realms. It is a place of living, consuming fire, with eyes coming out of that fire. I was shaking – in fact, everything was shaking. The scroll, which was written on front and back, was opened, and I saw my life. God showed me all the good things, where I had lined my life up according to my destiny. But I also saw all the rest too, the missed opportunities to be obedient. The fire of God came and purged it, and I was given a fresh opportunity. Every one of us can go to that place and see, does our life match up with our scroll of destiny? That is God’s intention, and He wants us all to make sure it does. Whether we are to be in the outer courts, the inner courts, the Holy Place, or the Holy of Holies: that will be decided by what is on those scrolls and how they match up. I know where I want to be. We will also have responsibilities in the age to come, which are determined by whether we are faithful here. Our destiny is not just something which is to be accomplished in the here and now, in this physical realm. When Jesus returns, He will put the earth back into its central place in the Kingdom of God. It was removed from that place and put into time, in order to restrict the effect of sin. As we move into the age to come, the whole world will be cleansed with fire and brought back into the place where the physical and spiritual realms overlap and interact. And we will have new physical bodies, which are immortal, in order to operate in that realm. When Satan fell, the light-bearer, light was removed from galaxies. In the age to come, those black holes which are at the centre of many galaxies will once again be filled with light. Who will get the opportunity of doing that? We will: the sons of light. At present there is a river of dark matter flowing through the universe which needs to be transformed. Who gets to transform it? We do. If Jesus created galaxies, who else gets to create galaxies? We do. We need to take the blinkers off our understanding, and grasp what God actually says about these things. 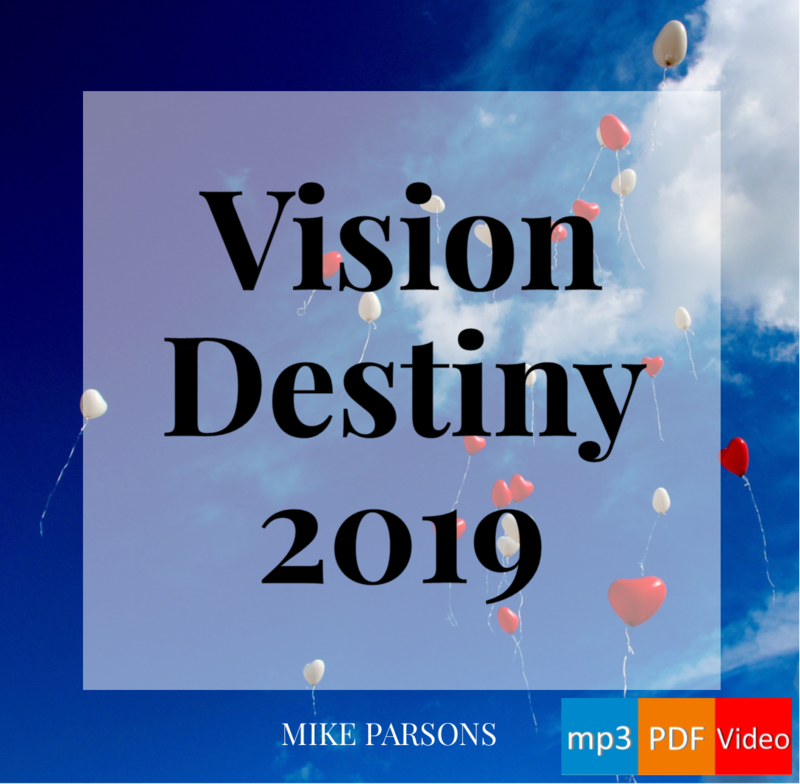 Our destiny goes way beyond this physical realm. It is awesome. When we first begin to go into the heavenly realms, our mind often gets in the way until we learn to see and operate there. He wants us to be free of the restraints which hold us back because of our mind and the way we think. There is a preparation we need to go through so that we will be ready for Jesus’ return and for our destiny in the age to come. We need a transformation in order to be manifested as the sons of God – on earth as it is in heaven, and then beyond. We all have a choice about whether we will be transformed; a choice about how we will spend eternity; a choice about whether we will fulfil our destiny. God gives us that choice, and the opportunity to outwork it day by day. There is always, has always been, a choice. There have always been two pathways: the Tree of Life, or the Tree of the Knowledge of good and evil; the kingdom of God or the kingdom that is in darkness (which is just as close). Kingdom in darkness, by the way, not kingdom of darkness. Satan has no kingdom. He only occupies the kingdom we were meant to be ruling over. He has brought darkness to that kingdom, and it is up to us to bring light into it. God wants us to transform the atmosphere of the earth and to bring light to that place of darkness, and to the places under the earth too. It is our right to rule there. God’s Prophetic Timetable all leads up to the time of Jesus’ return. After Jesus returns, we will go into our eternal destiny in the age to come. And that age to come is beyond most people’s capacity to imagine. Every one of us has been appointed to a purpose in the whole eternal destiny of God. Will we fulfil it? The choice is ours. Image attribution: the image U2 Gelsenkirchen August 3rd 2009 at the head of this page is by SteBo (Own work) [CC BY-SA 3.0 (http://creativecommons.org/licenses/by-sa/3.0) or GFDL (http://www.gnu.org/copyleft/fdl.html)%5D, via Wikimedia Commons. 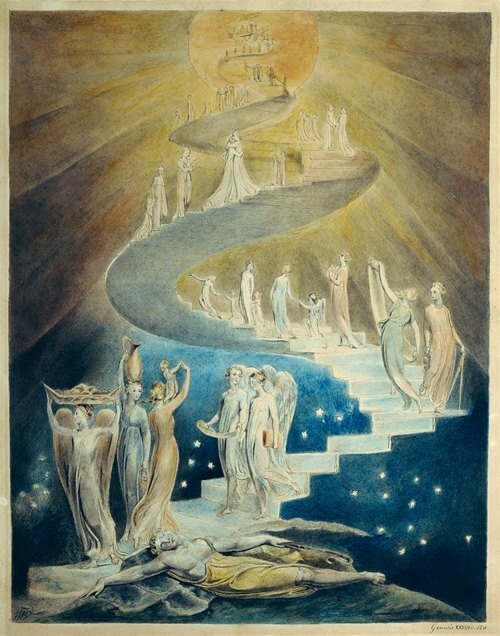 We looked in the last post at Jacob’s dream of a ladder set on earth and reaching into heaven. Now, let’s see how this worked out in the life of Jesus. And He said to him, “Truly, truly, I say to you, you will see the heavens opened and the angels of God ascending and descending on the Son of Man” (John 1:51). This is what happened in Jesus’ ministry, and it is why He was able to do what He did. We are also to do what He did, and greater things (John 14:12). If Jesus needed the heavens open and angels ascending and descending, then God does not expect us to make do with less. “No one has ascended to heaven but He who came down from heaven, that is, the Son of Man who is in heaven” (John 3:13). Jesus says that He is in heaven, although He is also at that moment speaking to Nicodemus on the earth. He was there then; He is there now. We too can be living in that realm of heaven and also living on the earth. We too can live in dual realms of authority, outworking heaven on the earth, here and now. “If anyone serves Me, he must follow Me; and where I am, there My servant will be also; if anyone serves Me, the Father will honour him” (John 12:26). If Jesus is in the heavens, we can be in the heavens; and that is where we occupy thrones and mountains. It is where our authority comes from to rule in this earthly realm. “In that day you will know that I am in my Father. You are in Me, and I am in You” (John 14:20). That is the relationship that makes us the house of God: “We will come and make our home (our dwelling-place) with him” (v23 Amp). The kingdom of God is within us (Luke 17:21). We are a habitation of God – a place where He lives, Father, Son and Holy Spirit. We are connected to God, and a gate of God’s glory. The key to understanding this is for each of us to know that we are a dwelling place of God here on earth and that the door of heaven stands open for us to access the heavenly realms. We can experience that place and bring the authority of those heavenly realms back from there to here. Then it can be ‘on earth, as it is in heaven’. We have to manifest the kingdom of God, just as Jesus did. For some time now here at Freedom we have been experiencing an everlasting door which is open. One door which is open over us here as a church, and it is manifesting as the glory of God. Sometimes in our worship and in what we do with the flags and streamers and rhythm and dance there are flashes, glimpses of the glory of God coming down through those realms. We have become a landing strip for angels. And that is with one door, not even fully open, over one local church. Imagine how it would be if all seven were fully open! It would be like heaven on earth. God’s church around the world needs to have all those doors open; to have continual revival, which will not stop. We need to see unrestricted manifestations of the glory of God for healing and health, for deliverance and freedom, for mandating us to come into the fullness of our destiny. To get to that point, everyone is needed. None of us can do it on our own; and we cannot do it with just a handful of people: the whole church needs to be involved in these things. God is calling all of us to do the works that Jesus did. Every single one of us has been called and mandated with an authority to bring heaven to earth. Let us put it plainly: God is calling you to take your realm of authority in your life on the inside and in the heavenly realms, and to start occupying God’s kingdom and bringing it here on earth as it is in heaven. Are you up for that? Do not think, ‘Oh, that kind of thing is not for me; I never get anything like that’. Start operating with God, in the garden that you have on the inside. A door will begin to open up for you into the heavenly realms: step in and you will start to experience more and more. It is God’s intention to do this with you. It is for every single person reading this: that is why we began writing this blog back in 2011, trusting that God would help you find it. And part of the reason God is raising us up as a resource centre is that we are called to support you and encourage you and help you as you find your way in these things. Time is speeding up, there is an acceleration happening. When God suddenly comes and starts doing something different, what used to take years can take months, weeks, or even days. Will you run with Him? Father we pray for all the frazzled minds that are out there. As a lord, as a king and as a son of God. To do the works of Jesus here on earth. With the authority they have in that realm to occupy those thrones. And to manifest Your kingdom through their lives. And step out of your kingdom by faith every second of every day. Where we can fully be the manifest sons of God on the earth. Holy Spirit, we pray You would do that in our lives. And let us be lifted up as the gates of heaven. Even lift them up, you everlasting doors! ‘The King of Glory shall come in’. The King of Glory will come through those doors from the heavenly realms into this realm, bringing with Him the glory of God. This still happens from time to time, and we call it revival, transformation, awakenings. These are all manifestations of the power of God and the presence of God through the angelic which come through those doors. Who is the King of glory? The Lord strong and mighty, the Lord mighty in battle. Things begin to happen as soon as we start lifting up our heads, as gates. We understand that each of us is a gate for the presence of God to come through, a gateway between heaven and earth. By now we know to think Hebrew not Greek, function not form. Your head is the place of government, authority and rule. The function of the head is to rule, and to lift it up is to rule at a higher level. Once we start to lift up our government to a higher level, then the lifting up of the everlasting doors starts to take place and the glory of God begins to manifest. As often in the psalms, the phrases are repeated, but with subtle changes. Next time around, in verse 9, we notice that it says, ‘even lift them up, you everlasting doors’. Once you have been lifted up to a realm in the heavenlies, once the gateway is open, God comes and stands in the gateway. I’ll show you that from scripture in a moment. When God comes and stands in the everlasting door, that whole realm lifts up the gate to a higher level. It is the fact that God is standing there in the doorway that enables things to go to an even higher level of authority in the Kingdom of God. Who is the King of Glory? The Lord of hosts. Now we have a name. Before, we had what He did, but now we have His Name. Do we understand the Name of the Lord of Hosts? It means ‘Lord of the Angel Armies’. Once we start accessing the courts in the heavenly realms, the Lord of the Angel Armies is actually releasing the angelic to operate amongst us. Some of us know this by experience. In fact, more and more of us are starting to see angels, and experience the reality of angelic activity, and recognise what is going on in these realms. He is the King of Glory, and the King of Glory is going to manifest Himself through the angelic in these days. Where in scripture do I see God standing in the gateway? Genesis 28:12-15 talks about Jacob. He had a dream, and behold, a ladder was set on the earth with its top reaching to heaven; and behold, the angels of God were ascending and descending on it. And behold, the LORD stood above it and said, “I am the LORD, the God of your father Abraham and the God of Isaac… Behold, I am with you and will keep you wherever you go”. I met Jacob in the heavenly realms – he was the first of the ‘cloud of witnesses’ that I met, one of the men in white linen who are there to help us from past generations. He spoke to me about this passage and told me to study it and to understand how this works. So I have been looking at his experience and his life (and talking to him about it). That ladder was set here, on the earth, not in heaven. Its top reached into heaven, which means we have access here to reach into heaven. The angels are mentioned first as ‘ascending’, so they were already here. They were going up, and they were coming back down bringing the kingdom and the revelation of the glory of God back down with them. And here is where we see God in the gateway: “the LORD stood above it” (v13) – He was standing at the top of the ladder. Ho promised to be with Jacob and keep him – the King of Glory starting to manifest His presence. He was afraid and said, “How awesome is this place! This is none other than the house of God, and this is the gate of heaven” (Gen 28:17). Jacob had called this place Bethel, meaning ‘house of God’, and God told him to go and live there. We have to go and live in the place where we are the house of God and where we are a manifestation of the gate of heaven. “Make an altar there”, a place of sacrifice. “Put away the idols which are among you, and purify yourselves and change your garments” – that is a description of what is going on with us right now in God’s Prophetic Timetable. There is sacrifice, a purifying, a removing of idols, and a change of garments taking place. And no, it is not necessarily a painless process. The diagram above is a representation of the realms of heaven we have been exploring. You may have heard people talk about the first, second and third heavens. In the past, that may have helped us to get some understanding of where we were, and how we could interact with heaven, but it was very basic, and in fact it was very flawed. With our Greek (rather than Hebrew) understanding, we assumed that we had to go through the second heaven to get to the third, and that is not the case at all. Instead of layers, we now think realms, or dimensions. We have spoken before about seven realms, three into the earth, the atmosphere of the earth, and three into the heavens. Looking at the diagram above, we live our physical lives here in the Kingdom of Earth, where we can experience God’s Presence. We are also aware of the atmosphere of the earth – remember that Satan was called ‘the prince of the power of the air’. There are actually three spheres within the atmosphere of the earth: rulers, powers and principalities. These were created by God, but are currently occupied by the forces of evil. Up to now they have been reasonably successful in blocking the flow of God’s glory from coming to us through the Everlasting Doors (we will consider these Everlasting Doors in the next post). Moving into the heavenly realms, we see the Kingdom of God, the place of God’s government. Fallen angels and the demonic still have access there, but they do not have access to the Kingdom of Heaven. The Kingdom of God is where the court is in which Satan accuses the brethren. But the devil and his angels have no access beyond this, to the Kingdom of Heaven, or to Heaven God’s abode – though we do; it is where we are seated with Christ in authority. And beyond that, there are other realms as you see. Under the earth there are also three realms. These were all created by God, but are now occupied by fallen angels: Sheol is the place of the dead; Tartarus is where the ‘angels who did not keep their proper place’ are chained up; and Satan’s Lair. There are other places down here as well, including Satan’s trophy room that we have written about before. God’s intention is that we take back all the realms currently occupied by the enemy. But it is not for us to engage fallen angels – there are twice as many angels on God’s side who will do that for us if we learn how to interact with them. Our role is to take up our mantles and operate in the authority that God has called us to exercise. In the heavenly places there are mountains, and thrones on those mountains. That is to say, there are places of authority, and seats of rulership. Associated with those mountains and thrones are scrolls: decrees, mandates, and resources we can draw upon. Freedom Church has seven mountains and seven thrones. They were not unoccupied – giants were sitting on them, and they have had to be unseated. In fact every church has mountains and thrones of its own which relate to God’s purpose and calling for that particular body of believers, so every church needs its giant-killers. And we all as individuals have seven thrones, which we need to go and occupy. Family, marketplace, gifts, ministry, calling, and so on – there are many different thrones we might have, and we only find out through revelation, from God showing us. Remember, if we are not sitting on them, something else is, and it will need to be battled with and dethroned. Killing a giant is not difficult, but it takes spiritual effort: we are going to need to build up our spiritual muscles. If the throne is rightfully yours, you can dethrone the giant and occupy it. But you have to have the authority to rule there – you can’t just go and take someone else’s mountain and throne for them. I know this may all seem a bit ‘out there’, a bit Lord of the Rings, but actually Tolkein understood some of these things. Giants, dragons – you have to chop off their heads, rip open their bellies, and recover their spoil. With all this talk about rule and authority, please understand we are not being arrogant. In the kingdom, the last will be first and the first last. The ruler will be the servant of all. We are not rulers to lord it over people. It is a different kind of authority. We are there to support people, serve them, help them discover their gifting and their own God-given mandates, to bring others where we are and beyond. That is how it is with the Joshua Generation. The plain truth is that if we are to bring heaven to earth, as we have said before, we need to access heaven. That is how Jesus did it. He brought heaven to earth in the form of miracles, deliverance, healing, salvation, transformation, signs and wonders – and He did so by operating in dual realms (look at the present tense of the verb ‘is’, in John 3:13). There are higher levels of mountains within the Kingdom of God, and dragons occupy those thrones. I have been there, fought dragons, but I can’t do it all myself. No-one can. As yet I have only seen a handful of others there, but it is time for us all to step up and begin to occupy the places of authority God has given us. There are yet higher mountains and higher thrones in the realm of the Kingdom of Heaven (a yet greater degree of authority and rule). The mountains actually represent our governmental positions of authority, we are mountains. When we occupy the top mountain, our governmental position, we can rule all the other mountains from there. It is time for us all to act as the lords, and kings, and sons we are called to be.